long lasting, brightly colored, petal-like bracts surrounding small tubular flowers from early spring through late summer. In zones 10-12 Bougainvillea plants can be grown in the garden where they can be trained to climb 10-20 feet to cover porches, archways or walls or they can be grown as a colorful, spreading ground cover. 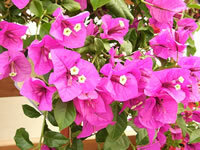 Bougainvilleas are also well adapted to growing in containers and can be grown as house plants. Bougainvilleas have strong, woody thorns. The older the plant gets, the longer and bigger the thorns will be. Bougainvillea plants do not transplant well, so select a sheltered planting site in full sun where they can grow undisturbed. They aren't overly fussy about the soil as long as it is well drained. However, the addition of compost, processed manure or peat moss to the planting hole will get your Bougainvillea off to a good start. Bougainvilleas are very drought tolerant once established and should only be watered when the soil is dry an inch below the surface, except when growing in containers which should be kept slightly moist. Feed your Bougainvillea monthly beginning in early spring using a low-nitrogen, bloom type fertilizer, following label directions carefully. Do not fertilize in the fall or winter. Prune freely after blooming. Flowers appear on the new growth. a minimum of five hours of bright sun each day and adequate humidity. They should be grown in a rich, well-drained commercial planting mix that is NOT pre-fertilized. Repotting should be done in late winter or early in the spring. Keep the soil evenly moist during the growing season, but allow it to gradually dry out by winter. Feed actively growing plants every two weeks with a soluble house plant type fertilizer, following label directions carefully. 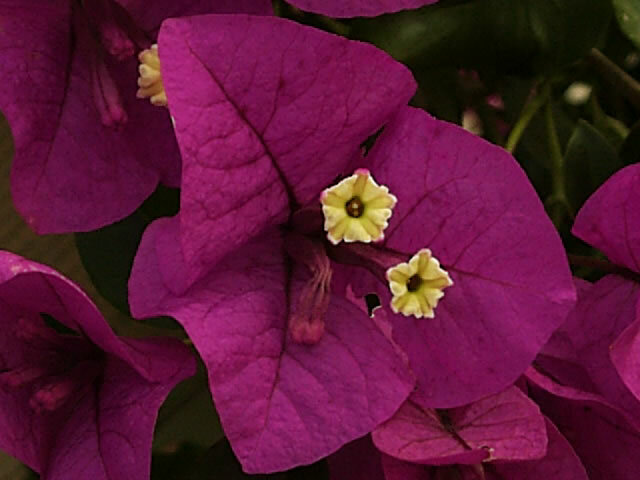 Bougainvilleas grow best with night temperatures of 65° and daytime temperatures of 70°-80°. Grow your Bougainvillea on a strong trellis or prune it in the spring to maintain a shrubby growth habit. Container grown Bougainvilleas can be moved to a sunny spot in the garden for the summer, but should be allowed to gradually dry out before bringing them back indoors by mid autumn. Inspect your plants carefully for spider mites, mealybugs and scale before returning them to the house. Bougainvilleas can be propagated with semi-hardwood cuttings taken in the spring. Bottom heat will speed the rooting process considerably. Bougainvillea seeds can be sown indoors at any time of the year. Maintain a temperature of 70°-75° within the growing medium until germination, which typically takes 30 days or longer.